The sea is a living element in Barcelona. At the end of La Rambla, which reaches almost to the water's edge, Columbus's statue greets you from his perch and Port Vell opens up at his feet, embracing life and the spirit of the sea. Today, the promenade continues over the sea becoming the Rambla del Mar, which takes us to Maremàgnum, and it has been transformed into one of the city's most important places for leisure and relaxation. With its four centuries of existence, Port Vell is the oldest part of the Port of Barcelona, and it is still in use today. It was the city's first stable quay, where ships could dock to shelter from storms, and it effectively separated the city from the water. Created by scraping sand from the land to the sea, the construction of the port signified Barcelona's opening up to other lands. It is this port that has given Barcelona, over the centuries, a common identity with other Mediterranean port cities: commercial, advanced, and a little bit roguish. Port Vell, now remodelled and converted into a seafront promenade that has won over the locals, extends from the imposing Gothic Drassanes Reials, the royal shipyards, to the Llotja de Mar exchange, an impressive Neoclassical building that hides inside it the remains of the old, Gothic-style Llotja. In between, at the Portal de la Pau, from where Columbus shows us the way to the Indies, there are new promenades over the water, such as the large, raisable walkway that joins this point to the modern Maremàgnum shopping centre. Contemporary art has also claimed this spot, and while on the land side there are works by Roy Lichtenstein and Xavier Mariscal, floating on the sea are sculptures by Jaume Plensa. 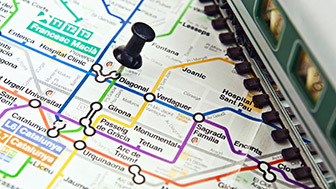 But if there is something that steals the hearts of locals and visitors alike, it is the "golondrines", recreational boats that for more than 125 years have been offering trips on the Mediterranean waters from Barcelona's Port Vell, and which allow you a privileged view of the city from the sea. 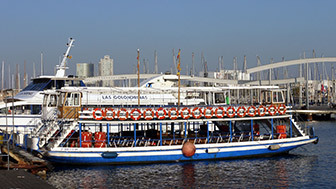 The old golondrinas may now be modern catamarans. 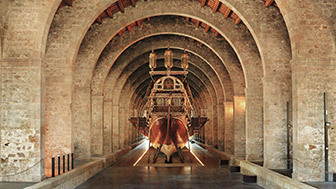 The Royal shipyards are now the Barcelona Maritime Museum.